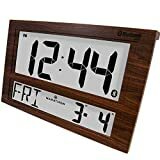 In this article I am going to show you your best options if shopping for a digital calendar clock. You might want one for various reasons, which might make your preference different than mine. Throughout the article I’m going to give you my recommendations for a digital calendar clock based on your specific needs, but to begin, I’m going to show you what my personal selection would be if I were buying one. What is a digital calendar clock? Why should you buy a digital calendar clock? What are some of the key features you might look for? 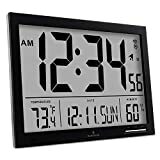 This extra large digital clock is advertised as a great choice for the visually impaired, but even if you have no vision problems I would recommend it. It is very nice-looking with a white frame, black background, and large white block letters. 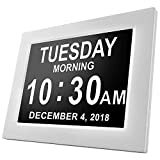 The display clearly spells out the day of the week, followed by the time of day (for example: “MORNING”), followed by the exact hour in numerical form. Underneath, the month is written out, followed by the date and year in numerical form. The clock is also great of you are someone who needs multiple alarms or reminders throughout the day. It includes five multi-function alarms and allows you to set reminders if you need to take medications at specific times during the day. If you or a loved one suffers from dementia or any memory loss problem, the reminders can be very useful. Although the product is recommended on Amazon as a great gift for someone with dementia, the packaging does not suggest so, so as not to offend anyone. The clock features a “battery backup” which allows it to reset correctly in the event of a power outage. It also features a 1-year unlimited warranty and a 100% money back guarantee. When you consider all of its features, the clock is very reasonably-priced, and also has terrific customer reviews. This would be my personal pick. A digital calendar clock is a device that displays the time in numerical form as well as the date, month, and often year. Most digital calendar clocks include multiple alarms you can set. Some have unique features such as a temperature display, and some specialized ones tell you a lot about the current weather in your location. Some require batteries while others can be plugged into a wall to charge. Most have a display of between 4 and 12 inches, but sizes vary. Digital calendar clocks are popular for people with memory problems, including Alzheimer’s and dementia. These people often have trouble remembering what day it is. A clock that clearly displays the time and spells out the day of the week and the date, month, and year can be very useful for them to have around the home. The multiple alarms on many clocks also help remind them of when to take pills. If you have a loved one who suffers from Alzheimer’s or dementia, it can be a great gift idea. Displays time, day of the week, date, month and year: This is the main feature offered by almost all digital calendar clocks. 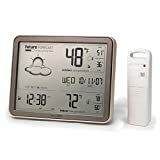 Displays temperature and weather: Some clocks are virtual weather stations and can tell you everything from indoor/outdoor temperature to humidity to current and near future weather forecast. Large, easy-to-read display for those with visual impairments: Many of the clocks have very large displays to help those with vision problems. The display often uses large block letters and clearly spells out the date and time with little or no abbreviations. 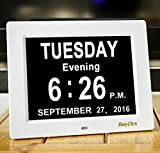 Display size: While some clocks are smaller, most of the clocks designed for those with visual impairments or memory issues have at least 8-inch display screens. There are various size options available. Multiple alarms to be set at different times throughout the day: This can be a great feature if you are simply someone with a busy schedule. It is also often used by those who suffer from Alzheimer’s or dementia as a way to help remind them when to take their pills. The clocks in general are regarded as a great gift idea if you have a loved one who suffers from memory loss. Battery vs cord powered, or a rechargeable battery: Many of the clocks run on AA batteries or something similar, and often the batteries are not included with the product itself. However some clocks run on A/C power adapters, and some have rechargeable batteries. Some even have unique features such as a USB outlet for charging via USB cable or a solar panel to charge via sunlight when outdoors. Wall mounted vs table standing: Some clocks can be either mounted on the wall or stood on a table, while some clocks can only be displayed via one option or the other. This might be of importance to you depending on your home environment. Wooden vs plastic frame: This might be a deciding factor for you if you like the look of one or the other better. Different color options: While most clocks come with standard black, white, or gray displays, a select few are available with multiple color options. Available in various languages: Many of the clocks are available in up to eight languages. While English is almost always the default language, common European languages such as Spanish, French, and German are almost always available. Automatically adjust time: Some clocks automatically adjust after power outages or at daylight savings time. Adjustable format: Some clocks allow you to change the display format for the date (for example, mm/dd/yy vs. dd/mm/yy). Other clocks also allow you to change the display mode to display what information is most important to you. Energy-saving features such as automatic dimming: Many clocks automatically dim during night hours to save energy and make it easier for you to sleep. Special features like a talking clock or a clock with WiFi: Talking clocks can be advantageous for those with severe vision problems or for the elderly who would prefer an announcement of the hour every hour on the hour. Clocks with WiFi might be of interest if you are a technology buff with interest in the Internet of Things. Warranty: Most clocks come with some sort of warranty, often 1-year. 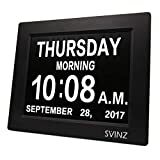 The SVINZ 3 Alarms Dementia Clock is noted by Amazon as a top option for seniors. It has an 8-inch HD display with the day of the week, month, and date. It also displays the time of day based on five different periods, ranging from “PREDAWN” to “NIGHT”. It includes three daily alarms and different dimming options. 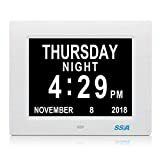 The SSA Digital Calendar Days Clock is another great option for memory loss sufferers. It spells out the day of the week, month, and date in bold letters on an HD display. It runs on an A/C adapter, which is included, so no need for batteries. It has a slightly larger display size than the aforementioned SVINZ clock, but is similar in shape and overall look. It is shipped with a plastic screen protector to protect the screen during transit. The American Lifetime Day Clock, which I chose as my best overall pick, is also a great pick for memory loss sufferers. The American Lifetime Day Clock wins this category as well because of its large, easy-to-read block letters with no abbreviations. My vote for the best bargain clock goes to the YouCoulee Backlight LCD Clock. 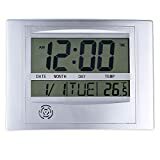 It offers all of the essential features of my top picks (day of the week, month, date, time, and temperature) at approximately one-third the cost. The only things that separate it from my top picks are its small size and lack of easy readability. However if size isn’t a concern for you this clock may be your best option. It has an LCD alarm with snooze button, and a rechargeable battery which can last 7-8 months on a full charge. This Umexis clock is another good option if you are on a tight budget. This clock can be wall mounted or stood on a table. It offers the same basic display features as the YouCoulee model mentioned above, and even has a larger display. The only downside is that it does not feature a rechargeable battery. It runs on two AA batteries, which are not included. The La Crosse Digital Wall Clock is also a good bargain. It has very similar features to the Umexus clock mentioned above, only with a smaller screen. 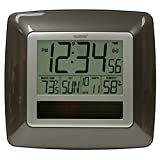 La Crosse offers many similar models including thing Solar Atomic Digital Wall Clock (Amazon product code B0054SKIKU) at various prices. A UK company called DayClox offers a great selection of higher end digital calendar clocks. (See Amazon product code above for an example.) The model shown in the link has an 8-inch screen with the same easy-to-read day of the week, time, day, month, and year mentioned in many of the other clocks. The date can be adjusted to British mode (dd/mm/yy) or American mode (mm/dd/yy). It comes with a power adapter and a 6-foot cord and requires no batteries. It dims at night from 7 p.m. (1900 hours) until 7 a.m. (700 hours). It can be wall-mounted or stand on a table with its built-in stand, and can display in eight different languages. It has been rated as one of the best for Alzheimer’s and dementia sufferers. Designer frames are also available at additional charge. Please note that prices on their website are shown in Euros. DayClox also offers a Color Display Clock which is only available in English. It displays the same information as the previously mentioned clock, only with a red, white, and blue display. It is also available with a black and white layered display the same style as the colored one. This clock also displays the words morning, afternoon, evening, night, and before dawn depending on the time of day. It is also great for dementia sufferers and the visually impaired, and has the same dimming feature mentioned in the previous clock. Overall it is very similar to the previous clock. The SSA Digital Calendar Days Clock and the American Lifetime Day Clock, both already mentioned, also fall into this category. While they are more reasonably priced than the DayClocks and Dawn Clocks models, they are arguably the best overall even if you have a limitless budget. 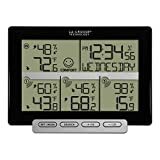 If you are looking for a digital calendar clock that also shows current temperature and weather conditions, my pick would be one of two La Crosse models. The first one shown in the link clearly displays the day of the week, date and time in the bottom left corner. The rest of the display is dedicated to temperature and weather conditions. The upper left corner shows a picture of the forecast with six weather conditions ranging from sunny to stormy. The upper right corner shows the outdoor temperature and humidity level, while the bottom right corner shows the indoor temperature and humidity level. It has a nice colorful design and an automatic reset for daylight savings time. The second La Crosse weather clock that might interest you is this black and white version pictured in this link. It displays the day of the week and time in the upper right hand corner. The rest of the display shows the indoor temperature and humidity, along with high/low temperature and humidity values. It can also automatically reset for daylight savings time. The batteries last over a year even when it is cold outside. 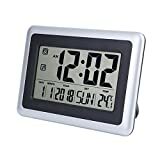 There are two other clocks I would recommend to you if you are searching for a virtual weather station. They are similar to the La Crosse models, although the time and date display is much smaller. 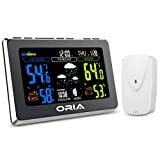 The first is the Oria Wireless Weather Station. It features the outdoor temperature and humidity on the left, the indoor temperature and humidity on the right, and the forecast in the middle. It updates outdoor weather conditions every minute and even includes eight different moon phases. It also has alarms and a USB port for quick and easy charging. It is also available in seven different languages. 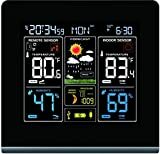 The Thinkgizmos Atomic Wireless Weather Station is similar in display to the Oria one. It has outdoor conditions on the left, indoor conditions on the right, and a picture of the forecast in the middle. It also displays moon phases and barometric pressure. The last product I should mention is this AcuRite Wireless Weather Station. While less colorful than the previous models mentioned, it also displays the day of the week, date and time, along with indoor and outdoor weather conditions. It also automatically updates for daylight savings time, and has a wireless range of up to 330 feet. All of the clocks mentioned within this section are within the same general price range. The Marathon Jumbo Bluetooth Clock System would be my pick if you are looking for an aesthetically pleasing clock. It has a large nine-inch wide display and a wood grain frame. It displays the time in large numbers on its upper display screen and the day of the week and date on its lower display screen. It has multiple display modes and up to five alarms. It also has a unique feature: a companion app you can install on your iOS or Android device to set the time, set a countdown timer, and record the temperature and humidity. Marathon also offers a Slim-Jumbo clock similar to the one mentioned above, only with a more slender wood frame. It includes a similar time and date feature and also displays temperature and humidity. It has a slightly higher price and in my opinion isn’t as good-looking as the previously mentioned Jumbo clock, but if you’re willing to pay the price and like the look it may be for you. The SVINZ, American Lifetime, SSA, and DayClox models already mentioned are also great-looking. Choosing the best depends on your specific tastes. The YouCoulee clock mentioned earlier would be my pick if you are looking for something with a rechargeable battery and that is good for the environment. Its rechargeable lithium battery, which is included, is said to cause less environmental pollution than normal batteries. It can be charged quickly and conveniently via a USB port. It also has different energy-saving modes to dim the display during nighttime. The La Crosse Solar Atomic Digital Wall Clock is unique because it has a high-efficiency solar panel that charges its rechargeable battery. It claims to be able to maintain full battery even in very little light. There is also a switch to disable the solar panel and use a regular battery if you like. Like most of the other clocks featured, the display includes the time, day of the week, month and date, room temperature, and humidity. The Relohas digital alarm clock has a feature that tells you out loud the time and temperature every hour on the hour. You can also press a button and it will tell you the time and temperature at any moment. It also displays the time, month, date, and temperature at all times, and has three alarms and seven ringtones. The Talking Time, Month and Date Clock has an older look to it, but can also tell you the time out loud. If you push the button once it will say the time, and if you push the button twice it will say the day of the week, although it does not say both together. 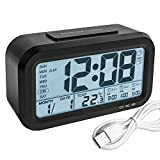 These American Time WiFi Digital Calendar Clocks are great if you are looking to add another device capable of reaching the internet to your home. They are much more expensive than most clocks, but that is to be expected with the WiFi feature. The clocks display the time, day of the week, and date, and are available in two sizes. You can configure the clocks to automatically join your WiFi network prior to shipping. This is a great idea if you are someone who is interested in the next wave of technology known as the Internet of Things. The Internet of Things has become a hot topic for those interested in the future of technology. Many experts are suggesting that in the near future our daily lives will be filled with dozens if not hundreds of devices that are all connected to the internet. If you are technology buff or simply interested in being involved in this phenomenon, a digital calendar clock that connects to WiFi might be of interest to you.